When it comes to making home-made toner, I keep it very simple. Just a few ingredients is all you need for a really good toner. I don’t usually like alcohol in my toners because it dries out my skin too much, but when I do use alcohol, I use a grain alcohol like vodka or sake. Summer time is a great time to use a bit of alcohol in toners because skin tends to be more oily during the warmer summer months. However, for every day toning, I like to use green tea. Green tea is rich in antioxidants and has anti-inflammatory properties. These keep our skin looking young and blemish free. 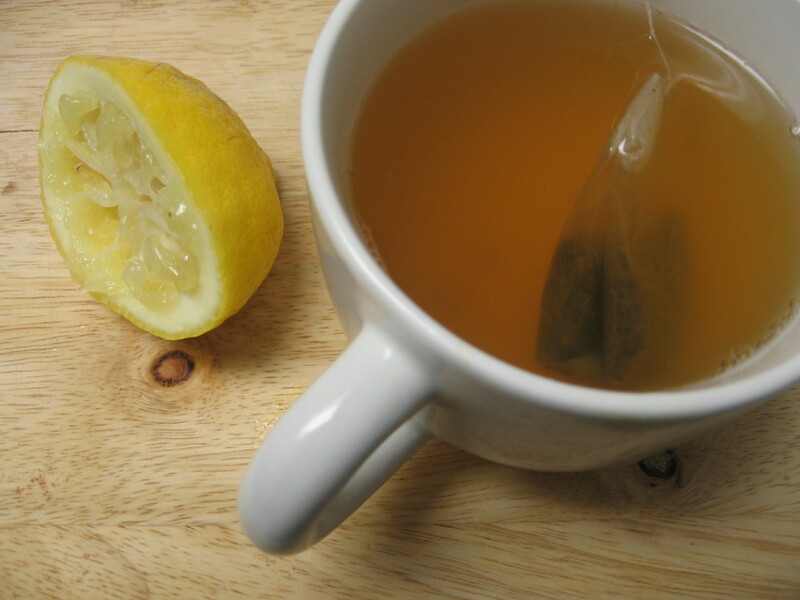 Adding a little bit of fresh lemon juice will also help get rid of blemishes, as lemon juice is a natural antiseptic. 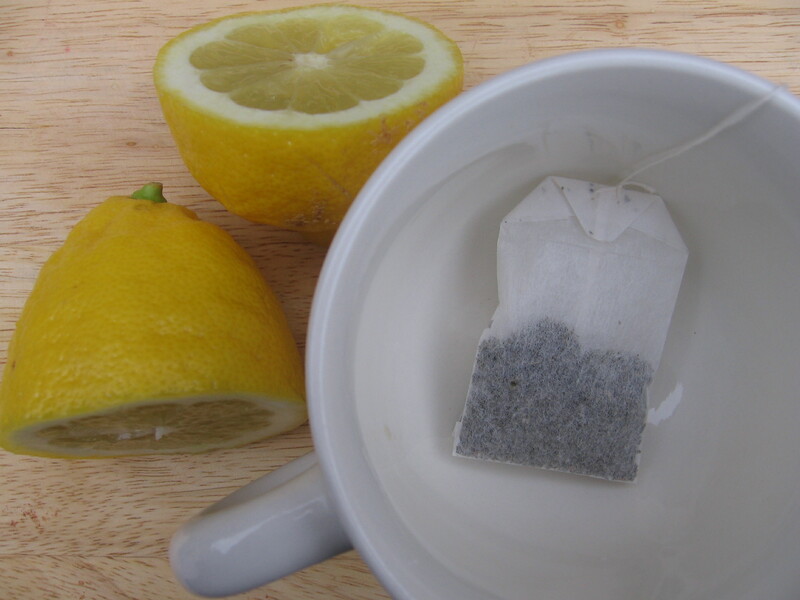 Lemons also contain vitamins C and B. Using it in your toners will give your skin a healthy glow. Steep the tea bag in boiling hot water. Add the lemon juice. Wait until the mixture is completely cooled and pour the mixture in a spray bottle. Add a drop or two of your favorite essential oil to add fragrance. I used lavender. To use, after cleansing, saturate a cotton ball with the toner and swipe it all over your face. I prefer using sugar or almond scrubs on my face rather than salt scrubs. Salt scrubs tend to be more drying and harsher on my skin. But remember, whatever you choose to make your scrub, make sure it’s mild and doesn’t irritate your skin. I use my Homemade Facial Scrub on a regular basis. It is my favorite. You can find the recipe here. However, I’ve been trying a new scrub and I think I’m starting to love it just the same. 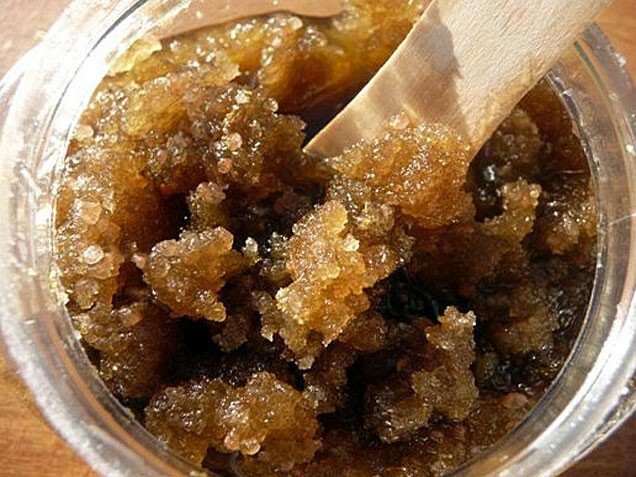 I love using organic brown sugar in my scrubs, and adding vanilla gives this scrub a sweet scent. Almond oil is an excellent moisturizer and it has a high content in fatty acids, which mimics our skin’s sebum. Finally, vitamin E is an antioxidant. It nourishes the skin and helps heal wounds. Apply the scrub to a clean face using circular motion. Be gentle and avoid the eye area. Rinse well with warm water and pat dry. Remember, do not use a scrub if you have acne, any irritation, or a sunburn. Give this scrub a try to and let me know if you love it as much as I do. Enjoy! I will eat almost any dessert that has coconut in it. I really enjoy the taste and the texture of it. However, I do not like cooking with coconut oil… go figure. Although many people love the taste of it, coconut in savory dishes is not for me. I do, however, have many other uses for my coconut oil. Coconut oil has a number of health, dietary, and medicinal benefits. But mostly, coconut oil is used in beauty products. Coconut oil, also called coconut butter, is solid until you put it in your hand, where it then melts immediately. It is rich in antioxidants, which slows the aging process of the skin, and antiseptic fatty acids, which keeps away harmful bacteria and fungus in the skin. It is also very moisturizing, but not for the reason you might think. Coconut oil is not easily absorbed by the skin. Instead, it mostly sits on the surface of the skin acting as a protective layer, keeping moisture in. This leaves the skin pretty slick for a while, until it is absorbed. I would not recommend this oil if your skin is already oily, as it may clog your pores. I do not use coconut oil, on its own, on my face; but I do mix it with other ingredients when making some of my homemade moisturizers. I do, however, use extra virgin coconut oil as a body moisturizer. But I still don’t like the feeling of greasy skin… What to do? I take a nice hot shower, which opens up my pores and readies them to receive nutrients. I then, before drying off, apply my coconut oil all over my body, except for my face. I do all this while still in the shower, being carefull not to slip, as the oil can my me and my shower very slick. Then I pat dry the excess oil and water. I feel this process helps my skin absorb the oil much faster and not leave the surface of my skin so oily, but rather with a silky feel and glow. How do you use your coconut oil? Let me know. I’m not a drinker, but Vodka is a spirit I always have on hand. Vodka was created in 1430 by Kremlin monks who used it as a topical antiseptic and cure-all drink. Vodka is a grain alcohol, which means it is made by the distillation of fermented grains or potatoes. Today, we can still use this clear liquid’s antiseptic properties for great beauty recipes. You can use straight vodka as an astringent. Just apply with a cotton ball morning and night to tighten pores, get rid of grime, and refresh your skin. Just a dab of vodka on a cold sore will dry it up. Adding a shot of vodka to your bottle of shampoo will help cleanse your hair and scalp. Some say it can also stimulate hair growth. And a shot of vodka to your conditioner will help seal cuticles and reduce frizz. Get rid of foot odor by soaking your feet in straight vodka. Or, add a little vodka to your foot bath during a pedicure. So remember, vodka is not just for drinking… save some for beauty. Enjoy! Apricots are high in mineral content. They contain vitamins A, B, and C and are very helpful in the removal of pimples and other blemishes. Apricots contain lycopene, which can help prevent cancer and heart disease. Apricot oil is cold pressed and refined from the dried kernels of the apricot fruit. 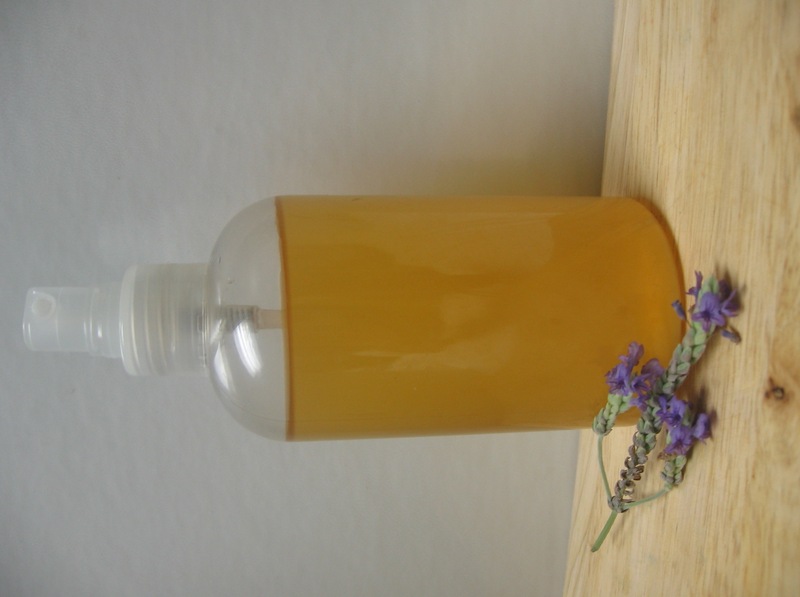 It is a very mild natural oil, often used in baby products because of its fine, gentle nature. It has anti-inflammatory effect which may help soothe minor skin condition such as scabies, itching and eczema. Apricot oil is also rich in essential fatty acids, which makes it a great choice for dry irritated skin, but is light enough to benefit oily skin as well, without leaving an oily feel, helping the skin retain its elasticity and suppleness. Combine all the ingredients in a food processor or blender and blend until smooth. Spread the mask on your face and let it set for 15 minutes. Rinse off with warm water and pat dry. Apply moisturizer. This mask will help your skin look and feel smoother and softer. Enjoy!